SQLite is an open-source relational database that is used to perform database operations on Android devices such as storing, manipulating or retrieving persistent data from the database. 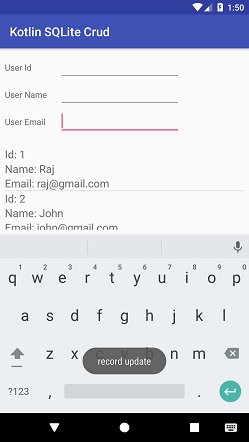 By default SQLite database is embedded in android. So, there is no need to perform any database setup or administration task. 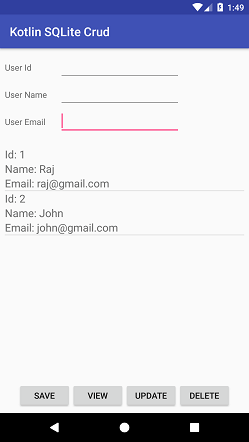 The SQLiteOpenHelper class provides the functionality to use the SQLite database. The android.database.sqlite.SQLiteOpenHelper class is used for database creation and version management. For performing any database operation, you have to provide the implementation of onCreate() and onUpgrade() methods of SQLiteOpenHelper class. SQLiteOpenHelper(context: Context, name: String, factory: SQLiteDatabase.CursorFactory, version: Int) Creates an object of SQLiteOpenHelper for creating, opening and managing the database. SQLiteOpenHelper(context: Context, name: String, factory: SQLiteDatabase.CursorFactory, version: Int, errorHandler: DatabaseErrorHandler)	 Creates an object of SQLiteOpenHelper for creating, opening and managing the database. It specifies the error handler. public abstract void onCreate(SQLiteDatabase db) Called only once when the database is created for the first time. public abstract void onUpgrade(SQLiteDatabase db, int oldVersion, int newVersion) Called when the database needs to upgrade. public synchronized void close () Closes the database object. public void onDowngrade(SQLiteDatabase db, int oldVersion, int newVersion) called when the database needs to downgrade. It contains methods to be performed on the SQLite database such as create, update, delete, select etc. execSQL(String sql): Unit Executes the SQL query, not a select query. insert(String table, String nullColumnHack, ContentValues values): Long Inserts a record on the database. The table specifies the table name, nullColumnHack doesn't allow completely null values. If the second argument is null, android will store null values if values are empty. The third argument specifies the values to be stored. update(String table, ContentValues values, String whereClause, String whereArgs): Int Updates a row. query(String table, String columns, String selection, String selectionArgs, String groupBy, String having, String orderBy): Cursor Returns a cursor over the resultset. 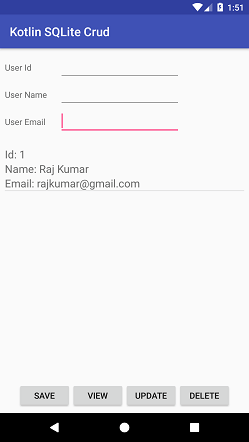 In this example, we will perform create, read, update and delete operation on Android SQLite database. In the activity_main.xml file add the following code. In this file, we added three EditText, one ListView, four Button for saving, view, update and delete operation. Add the following code in the MainActivity.kt class. In this class, the saveRecord() function saves the records. 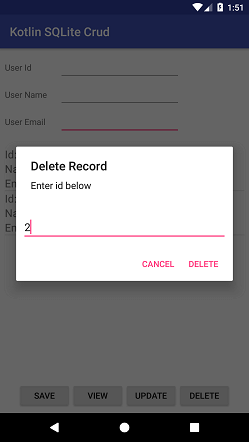 The viewRecord() function reads the record and displays them into ListView, the updateRecord() function updates the record on the basis on id, and deleteRecord() function deletes the record. The val databaseHandler: DatabaseHandler= DatabaseHandler(this) creates the instance of DatabaseHandler class calls the SQLite database logic. 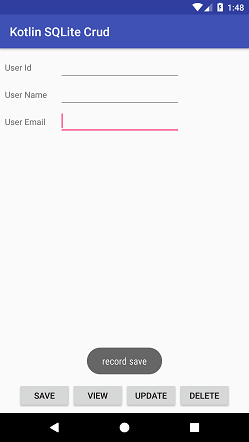 Create a custom row layout for displaying the list items in the ListView. Now, create a custom adapter class named as MyListAdapter.kt and extends ArrayAdapter class which populates the data model into the ListView. 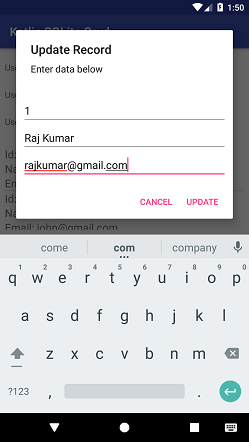 Create a layout for display AlertDialog for update record. 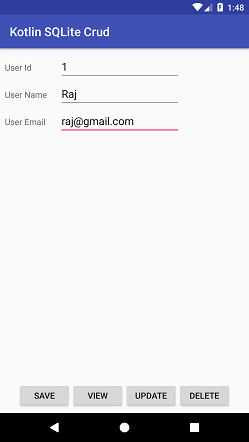 Create a layout for display AlertDialog for delete record. Create the DatabaseHandler.kt class that extends SQLiteOpenHelper class and override its onCreate(), onUpgrage() functions. Insert data into the database by passing a ContentValues object to the insert() method.